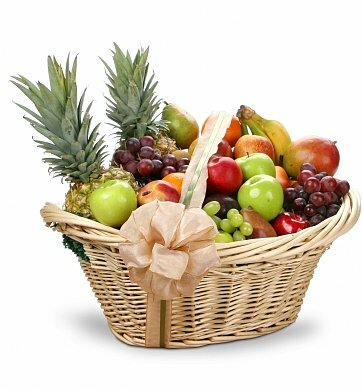 Our affordable First Class Fruit Basket is designed and delivered by an experienced local florist in your recipient's local area. Each basket is a one of a kind creation that may include apples, pears, oranges, grapes, bananas, or other fruits. Photo shown online is a representation only. Specific type of container and fruits included will change according to local availability and designer's preference. Same-day delivery is available. Contact customer service for more details. First Class Fruit Basket is a hand delivered gift. These gifts are delivered by one of our local design centers located throughout the United States and Canada. Same day delivery is available for most gifts when ordered before the cutoff time. The cutoff time for First Class Fruit Basket is 1 PM in the recipient's time zone. I ordered this for my parents' 73rd anniversary, and they absolutely loved it. The fruit assortment was great, and was beautifully presented. It lived up to this site's high standards. The picture on the website does not do it justice. The arrangement was strikingly beautiful and massive. It was all top quality fruit. The basket used was a lovely dark mahogany color which enhanced the bright colors and massiveness of the fruit. I choice to add a sparkling white grape juice to my arrangement. And the bottle looked very much like an expensive champagne bottle, giving it that extra touch and making it a genuine first class fruit basket. I was very pleased with the service and friendly user web site. The fruit was beautiful and tasty, it was well presented and delivered very promptly the next day! This "Get Well" fruit basket was right on target to cheer up a person recovering from major surgery. The recipient said it was beautiful and had every possible type of fruit. It was extremely easy for me as the sender and the regular status updates were very informative . we ordered from Sydney Australia for our son in NYC, he had had an operation, we were thrilled at the prompt delivery and it put a big smile on his face. We were very pleased , thankyou ! I sent the fruit basket as a thank you to a few people who work in an office I had done some business with. They had helped me out a lot. They called as soon as they got it to say how beautiful it was , and how surprised they were to receive it. I have been using Gift Tree for a few years now. I have never been disappointed with their products , service or delivery. And everyone I have ever sent Gift Tree items to has been very pleased as well. A great company with great service and prices , too. ...if you want to excell ... have a field on your order ... for small requests .. I would have been extremely happy if blueberries were added ...even if much other fruit was removed. you still better than 2 sites , I found as you allowed an Australian dad to send fruit to his daughter after an operation. other sites would not accept a foreign order. Our first grandson was born in Atlanta December 5, 2012, so I wanted to sent my daughter and son-in-law something healthy to snack on when they arrived back home after the delivery. They really enjoyed your first class fruit basket, citing the freshness and singular variety of the items, as well as the excellent tastes of the included fruit. Thank you for the timely delivery and excellent service. I sent this basket to my daughter for Mother's Day. Her eldest son is a diabetic so not only he but the whole family was able to share it's delicious wares.